GReads! 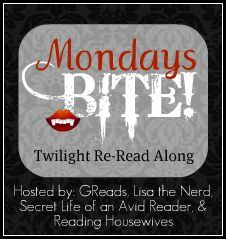 : Mondays Bite: Twilight Re-Read Along! Mondays Bite: Twilight Re-Read Along! Raise your hand if you've heard of a little known book about a vampire clan in Forks, Washington. What about a forbidden love between a girl named Bella and her soul-less boyfriend Edward? If you have no idea what I am talking about, then you must be living under a rock! Stephenie Meyer's Twilight took the world by storm over 5 years ago and it hasn't let up since. I know for me personally, Twilight is the reason I started reading young adult fiction. It then catapulted my desire to read more & more YA, which finally resulted in to this blog. Like so many out there, my love for this book has never faltered. It's been 3 years since I have visited Bella, Edward, & Jacob in Forks - but starting June 27th I plan to take a trip back! Will you join me? With the help of my blogger friends, we have put together a re-read along for Stephenie Meyer's first book in the series, Twilight. The read along will officially kick off on June 27th & continue through August 1st. The read along will be broken down to 5 chapters per week. Each Monday we will propose questions to be answerd for those particular chapters being read that week. Then the following Monday, the answers will be posted on the coordinating blog along with new questions for the next chapters. We encourage those who are participating to post your discussion answers on your own blogs that week as well! A link-up will be provided each week so that everyone can participate & view others responses. Below is the schedule for the Twilight re-read along. If you have any questions about this read along, feel free to contact myself or any of the bloggers hosting it with me. We want as many participants as possible! So make sure you spread the word. Get ready to be bitten & sucked back in on June 27th! Please sign-up below if you'd like to participate in the Twilight Re-Read Along! Great idea! Looking forward to this! I love it when people don't try to hide their love for Twilight! "Get ready to be bitten & sucked back in on June 27th!" Oh I am totally ready! Oh my gracious! Count me in! Can't. Hardly. Wait. 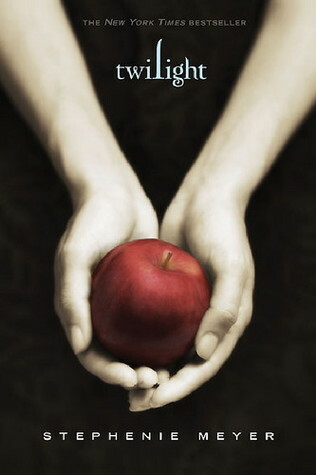 I just watched Twilight on cable yesterday and thought about re-reading the book...it's kismet! How much do I love this? Awesome G- Totally in! I seriously need to reread this series...but alas, my Harry Potter reread conflicts :( You guys have fun and I will keep an eye out for the discussions! Awesome! I don't know if I'll participate, but I'll definitely follow along with the discussion questions. I've been meaning to re-read this series. I'm excited to join in! I'm honestly looking forward to this. I don't think I gave Twilight a fair chance, I think I pulled away because it was so popular. I'm totally willing to do a nice read along and dig a bit deeper into this book! I haven't read Twilight yet, so for me it wouldn't be a re-read. Does that mean I can't play? I can't wait to head back to Forks either! I have missed it! I first read the series back in '09 and I've been wanting to re-read it for some time now. This is the perfect opportunity to do so! Ginger- Totally forgot you'd told me there would be a link up lol. Oops! I'm on there now and will repost on my blog shortly! I'm excited! Do you think you'll do a read-along for the other three books too at some point? I second Katie's buzz - so awesome when people dont feel like they need to HIDE their love for Twilight! Im thrilled to join this reread. Twilight is what got me back into reading YA fiction as well. I just joined, better late than never I guess. I'll have to catch up with everyone. I tried to reread the first book a couple years ago and couldn't get into it again for some reason. so this has been one of my biggest fails in a while. I did re-read the first 5 chapters and that's about it. So I don't feel like more of a loser, I've officially removed my name from the sign-up.